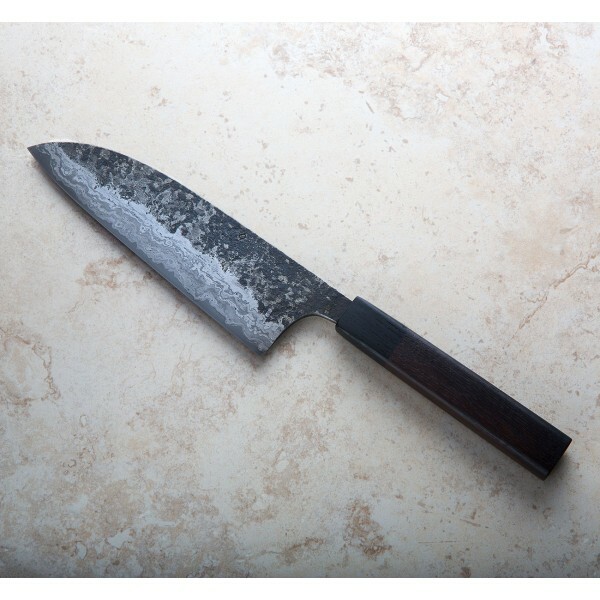 The 190mm san mai blade is forged from 52100 carbon steel with wrought iron from a re-purposed wagon wheel rim, and the two-tone handle is handcrafted from bog oak. 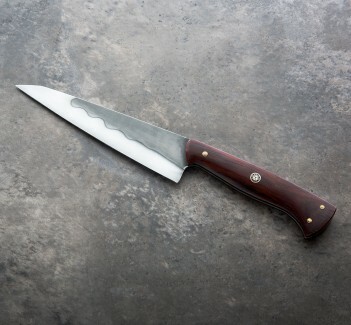 Our first from Robert Trimarchi of The Nine, this striking hand forged knife feels wonderful in the hand, nicely weighted for effortless slicing and balanced just in front of the choil. 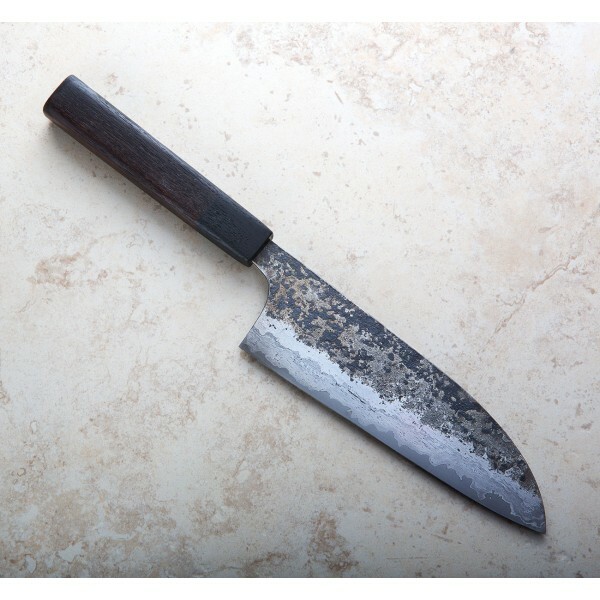 The 60mm tall profile, which we would describe as between a gyuto and santoku, is a true workhorse, exhibiting almost no flex, a full distal taper, a slight upsweep toward the tip, and an edge suited to push and pull cutting and chopping all day long. 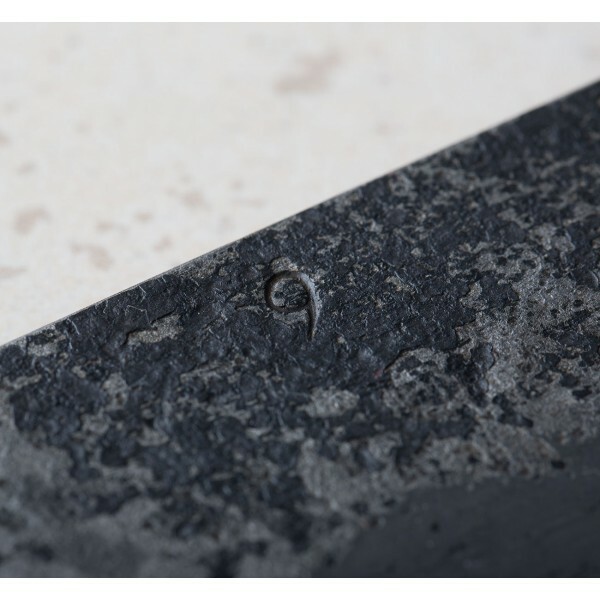 The blade is finished first on a grinder, then a waterstone followed by a hand-sanding and an acid etch to bring out a beautiful variety of tones. An American Oak saya is included with bog oak pin to match the handle. 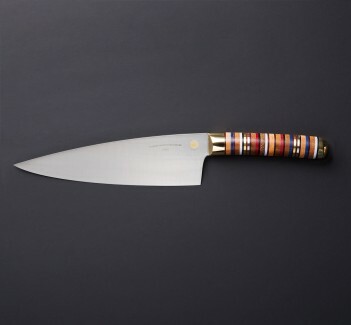 Traditional yet unique and recognizable aesthetically, Robert Trimarchi's work focuses, though not exclusively, on Eastern style chef knives with partial-tang construction and forged-finish flats, many employing his house-made san mai recipes and always heat treated in a methodical and controlled process for optimal performance. Inspired by his life-long exposure to the building, crafting and cooking of those around him, and with a background in woodworking, Robert's techniques and approach to bladesmithing, and more broadly to the craft of creating functional tools that others depend on, has made him an artisan we are proud to represent here on Eatingtools. 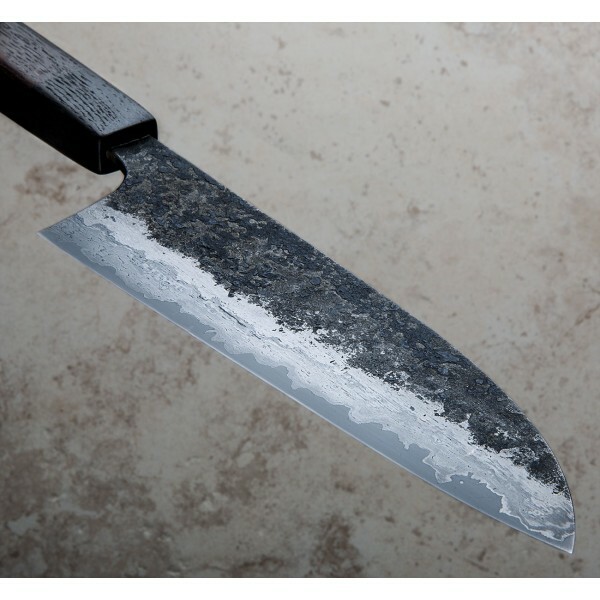 Blade length: 190mm (7.5"). Overall length: 12" overall. 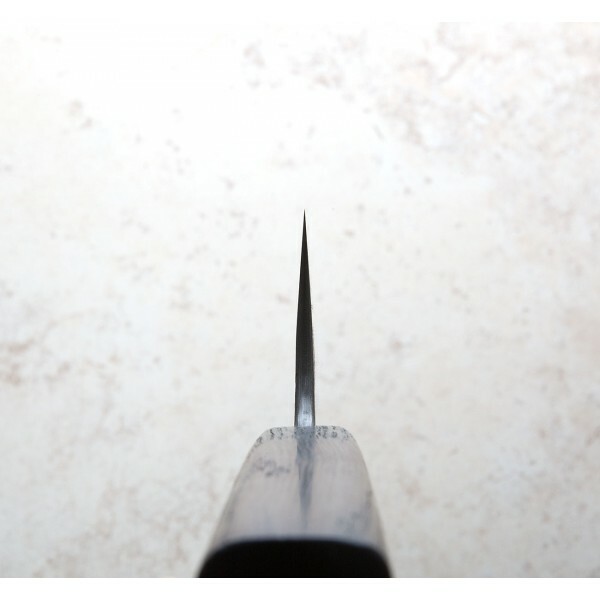 Blade width at heel: 3.75mm. Blade width 1.1" from the tip: 1.7mm. Blade height at heel: 60mm. Weight: 8.4oz / 238g. Blade: San mai steel with re-purposed wrought iron wagon wheel rims and a 52100 carbon steel core. Handle: Bog oak with contrasting bog oak bolster. 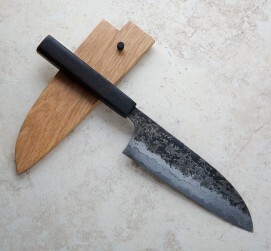 Saya: American oak with bog oak pin.